If you are interning with The Washington Center, remember there is no site offer form and no affiliation agreement required. When you submit your application, your internship site is The Washington Center, not the organization where you will be working. I believe TWC is still receiving applications. If you are looking for an internship, it would not hurt to stop by The Center For Career and Professional Development and talk to Diane Stipcak about possibly interning there. There is still time to get an internship! Stop by and talk to Dr. Lenze about options. Yes, he was very sick with pneumonia but he shook it off and is back! Please do not send internship documents to Dr. Lenze! All internship documents are submitted via this website. 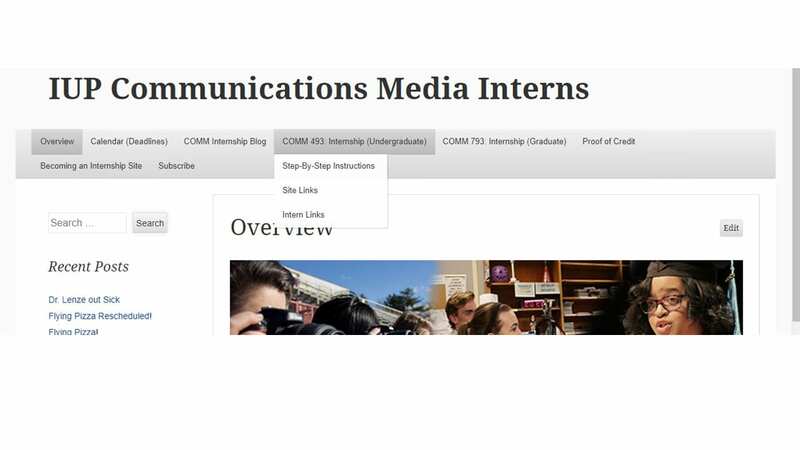 Go to the Step-By-Step Instructions under COMM 493: Internship (Undergraduate) or COMM 793: Internship (Graduate) on the menu bar. Each step tells you what to do with your documents. Dr. Lenze has pneumonia. But, he is available via email with questions and you may continue to submit internship documents via the COMMINTERNS website. Do not delay any actions regarding your internship. Do not wait for Dr. Lenze to return to campus. We will accept applications for internships of all kinds (affiliated and unaffilliated) until the 1st week of May. The Flying Pizza event is rescheduled for Wednesday, April 17 at 4 pm in the same location. For more details, visit the previous post. Event Rescheduled for Wednesday, April 17th at 4 pm. If you are interested in free pizza and learning more about earning your commercial pilot’s license to fly drones, sign up for a demonstration in the Environmental Pavillion behind Stouffer Hall on Wednesday, April 10 at 4 pm. Dr. Lenze will serve up free pizza, pop (soda if you’re from Philly), and even give you a chance to pilot the drone high over IUP’s campus! COMM 481 will prepare you to work as an aerial video pilot. You will develop a demo reel of the five most popular drone shots and be ready to pass the Part 107 FAA exam to be a commercially licensed drone pilot. Please sign up we know how much pizza to buy. Just a friendly reminder if you are planning on participating in the Communications Media Departmental Graduation Ceremony being held in Fisher Auditorium on Saturday, May 11, 2019, you will need to submit your completed yellow form to Stouffer 121 by Wednesday, April 10. If you have any questions, please stop by the office. This is one of our best internship sites! Students repeatedly tell us that the site is full of great opportunities with a very supportive environment! If you’re still looking for an internship, this is an ideal site! Hope all is well, Our PCTV internship program is filling up, I want to hold a few places for IUP students so if you could have anyone interested in a summer internship contact me directly I can on board them. Thanks. Attend a Focus Group April 23, 24 or 25th. Your chance to win a $50 Amazon gift card. The Southwestern Pennsylvania Commission is the official Metropolitan Planning Organization (MPO) for the ten-county region including the City of Pittsburgh and the counties of Allegheny, Armstrong, Beaver, Butler, Fayette, Greene, Indiana, Lawrence, Washington and Westmoreland. SPC is seeking interns (May-August) for various transportation planning/communications projects including traffic counting, transport modeling, data collection, database development -data analysis and related activities. Communications projects will include social media management, graphic design work, email marketing management, administrative support, multimedia support, photo and video editing, website maintenance and public meeting assistance to support the development of the new long range plan, Smart Moves. Interns may be asked to assist with projects outside their primary project areas. Preferred candidates would be enrolled in an undergraduate or graduate program in Geography, Planning, Civil Engineering, Information Science, Data Analytics, communications, public relations, journalism or a related field. Access to a vehicle for in-region travel and a valid driver’s license will be required for some positions. Hourly rate is $13.00. Travel will be reimbursed at the federal mileage rate of $0.58/mile. Additional information about SPC can be found at http://wwwspcregion .org. Email response preferred. Send letter of interest and resume in confidence to hr@spcregion .org or by mail to Two Chatham Center, Suite 500, 112 Washington Place, Pittsburgh, PA 15219-3451.